Discover all you need to know about shoulder training, including the benefits of working your shoulders, training tips, advice and much more. …It includes the exact information that you need to accelerate your shoulder training progress and amplify your gains. Continue reading to learn how you can build bigger, stronger and healthier shoulders in the shortest possible amount of time. What’s The Best Shoulder Training Strategy for You? Check out my article on the best shoulder exercises to look at the how-tos of these movements and discover their benefits. Shoulder Training Benefits. It is important to include shoulder training in your weight lifting regimen. However, as I’ll explain in the rest of this guide, you have to use the right amount of the correct shoulder exercises. Listed below are the benefits of proper shoulder training. Boulders for Shoulders! What guy doesn’t want shoulder muscles that are large and in charge? Well, maybe there’s a few that don’t, but I’d guess they aren’t reading this site. Muscular and powerful shoulders are soon to be yours after reading this guide. A well-structured and balanced routine that is structured around high quality compound shoulder exercises, will put you on the (rocky) road to boulder shoulders. Increase Your Bench Press. Want a stronger bench press? Do shoulder exercises. The barbell bench press is obviously a chest-focused exercise, but it requires a significant amount of effort from the deltoids. Any shoulder pressing motion will assist with your bench pressing abilities. Healthy Shoulders Are Happy Shoulders. It’s all fun and games until somebody pops their shoulder out. The shoulders are one of those body parts that tend to attract injuries (and re-injuries) due to their complexity. 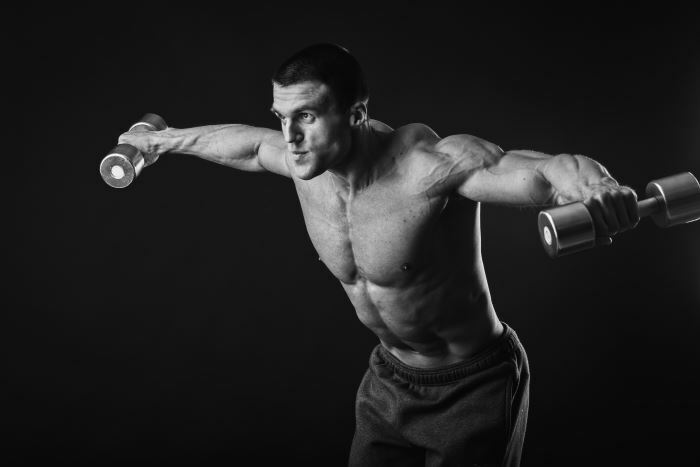 So what is a shoulder-health-conscious individual to do — Stop shoulder training altogether? Hell no! The way to shoulder salvation is to learn great exercise technique, work all parts of the shoulder evenly, fortify the rotator cuff muscles and always warm up. Bigger Triceps. Those boulder shoulders mentioned in the first bullet point are essentially useless… Unless you have a matching set of horseshoe-shaped triceps! All shoulder pressing movements require a significant amount of effort from your triceps muscles. The downside, though, is that it’s only a matter of time before you need custom shirt made to fit your gargantuan guns — Well, maybe you won’t need custom shirts, but your arms will grow noticeably faster. To best understand how to effectively train the shoulders, we must first review their anatomy. The shoulder anatomy includes two distinct sets of muscles: The deltoids and the rotator cuff muscles. The anterior deltoid (front), which controls raising the arms overhead or to the front. The lateral deltoid (side), which is responsible for lifting the arms up at the sides. The posterior deltoid (rear), which controls pulling the arms to the back. Although each deltoid has a it’s own independent function, they can also work together to carry out compound movements. Unsurprisingly, this complex shoulder structure is quite delicate a very popular injury location, especially amongst the not-so-cautious “meathead” gym-goer population. My favorite exercises for rotator cuff health include the dumbbell lying external rotation and cable face pull (with external rotation). Shoulder Training Tips. Now that you’ve got an idea of the best shoulder exercises, it’s time to build upon that knowledge with some training advice. Below, I’ll provide you with some shoulder training advice that you can apply to your workouts. Watch Out for Interference with Related Muscles. The shoulders are closely related to the chest and triceps. Therefore, you should allow enough rest time between sets, or workouts that train related muscles. Otherwise, it’s possible for the exercises to interfere each other. Note however, that the amount of rest needed depends on the workout; and sometimes interference will be unavoidable or necessary. Don’t Forget about the Posterior (Rear) Deltoids. The rear deltoids are often underdeveloped since most major shoulder exercises focus on front deltoids. How do you fix this problem? Just be sure to do ample pull exercises. Some good examples include pull ups and various bent over row exercises. You can also directly target the posterior delts by using isolation exercises such as bent over lateral raises. Use Mobility Exercises. If you can’t move your arms and shoulders efficiently, then you’re falling short of your shoulder training potential. Try shoulder dislocations, which involve gripping a stick (e.g. a broom stick) with a wide grip and bringing it from your front to your back; this is done by swinging it over your head, while keeping your arms extended and back straight. This can be done on your own time, and as part of your warm up routine. Train the Rotator Cuff Muscles. I’ve already mentioned the functional role of the rotator cuffs. And I’ve practically beat you over the head with the importance of proper exercise technique for protecting these delicate structures. Now I’ll tell you how to actively strengthen these bad boys so that you’re not only safer, but also stronger — Do internal and external rotation exercises, which strengthen the rotator cuff muscles that control the internal and external rotary movements, respectively. A common issue is that the many trainees who emphasize push exercises, often have very weak external rotators. These folks can benefit by performing more of the external rotation exercise, in addition to adding more pull exercises to their routine. A Time for Isolation. Compound movements should be the majority of your routine, especially if you’re a beginner. But there are always times where it’s necessary to add extra isolation work to the mix. For example, if you’re an experienced weight lifter who wants to increase your shoulder width, then you should consider adding side lateral raises into your routine. Another example is if you are trying to fix or prevent a muscular imbalance between your front and rear delts (see the second bullet). In this case, adding bent over lateral raises to your regimen can help you reach that goal. However, isolating the front deltoid is next to useless for just about everyone because it receives significant stimulation in all press exercises. …Once you “graduate” from the beginner routine, you can put effort towards shoulder specialization if you still think it’s necessary. So if you have a decent amount of experience already, then we can look at a couple different approaches that will target your shoulder muscles. …You must also remember that, when on a full body workout routine, you are training these exercises frequently (up to 2x/week). Savor these times as a novice lifter when you can make the greatest gains with the least amount of work! If you’re past the beginner stage, then you should still build your shoulder training regimen around the basic compound shoulder exercises. However, unlike beginners, you can benefit from diversifying your exercise choice to include multiple compound shoulder exercises as well as isolation movements.